Sgt. Edward R. Cooke marches in formation. Sgt. Edward R. Cooke embraces his family. In the digital age it is common for cell phone videos to capture the moment when a deployed soldier or sailor reunites with his or her family. Often these images and videos go viral, touching the hearts of viewers throughout the nation. In earlier eras, when photography was more cumbersome and less convenient, these reunions generally went undocumented. Yet when captured they can be just as heartwarming. 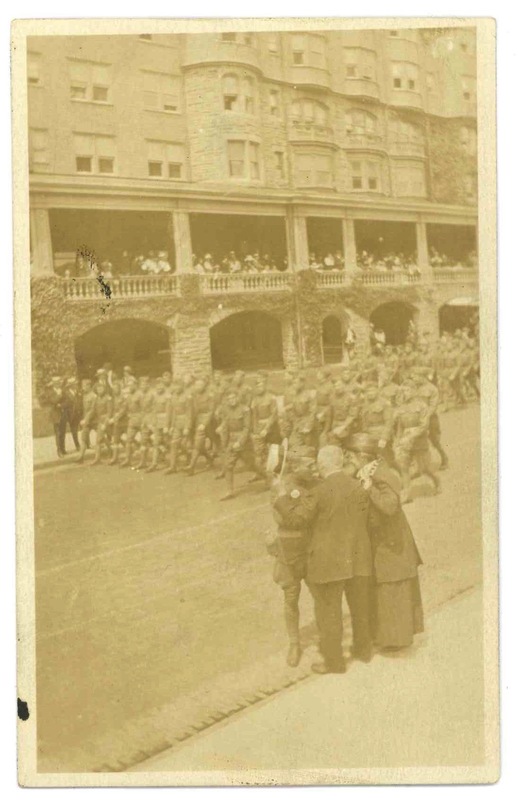 On May 29, 1919, the members of the 112th New Jersey Heavy Field Artillery, a branch of the New Jersey Army National Guard, paraded down Atlantic Avenue in Atlantic City. “Before a multitude of wildly cheering spectators, and under a network of decorations that transformed Atlantic avenue into a veritable two-mile bower of fluttering colors, the returned heroes moved in a parade this morning that was a continuous triumphal march,” reported one local paper. Nearly 100,000 citizens came out to pay tribute to “the bronzed veterans,” while state and local dignitaries sat on a reviewing stand in front of city hall. Among the 1,200 marching soldiers was Sergeant Edward R. Cooke, a third generation serviceman whose father, George R. Cooke, had been a Marine on the Pacific Ocean in the 1890s, and whose grandfather, Horatio D. Yeager, was wounded by two Confederate bullets at Gettysburg on July 1, 1863. Standing five feet, ten and a half inches tall, with gray eyes, brown hair, and a light complexion, Cooke was a twenty-five-year-old machinist when he enlisted in the service. 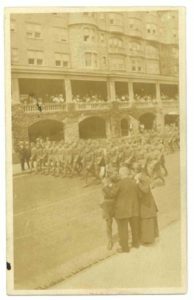 Within two weeks of joining he was promoted to corporal and then sergeant. Cooke entered the service at Camden, New Jersey, on July 25, 1917, and spent the next eleven months in training in Alabama and New York. His unit sailed for Europe on June 28, 1918, and arrived at Liverpool at 3 a.m. on July 10. By July 12, the 1,750 men of the 112th were in France, where they would spend the next nine months without seeing any combat. Throughout this period Cooke sent several dozen postcards to his parents and grandmother, showing them the sites he saw in France. Finally on May 13, 1919, Cooke and 1,200 of his comrades sailed from Saint-Nazaire. Their time in Europe was over. (Several hundred of them remained overseas, detailed to take charge of a Russian prison camp in Germany.) Upon arriving at Newport News, Virginia, on May 21, Cooke sent a brief telegram to his parents: “DEAR MOTHER AND DAD ARRIVED LAST NIGHT NORTH SOON LOVE EDWARD.” A week later his unit was marching through Atlantic City. 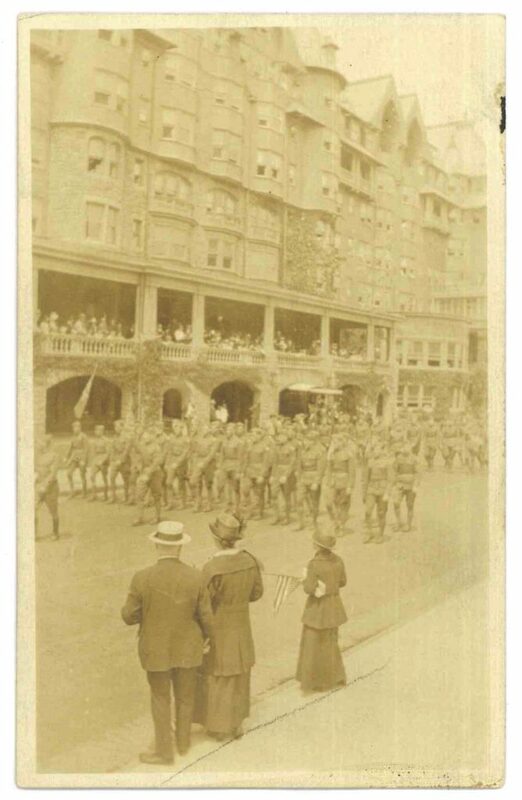 Recognizing the commercial opportunity with so many people converging on Atlantic City, one photographer set up his equipment on Atlantic Avenue to capture the soldiers as they marched by. In one image, he photographed a line of troops. In the foreground stand three figures—an older man and woman, and a younger woman who holds a small American flag. Moments, or perhaps minutes later, the photographer captured a second scene. In this one, a soldier breaks ranks and runs to embrace the three figures in the foreground. That soldier was Cooke. Somehow he had seen his parents and sister standing there. His comrades turn their heads in wonder as they continue to march. According to Cooke’s daughter, Jane, Edward and his family did not know that their heartwarming reunion had been captured on camera. Only later in the day, when they were walking around the boardwalk, did they see the “before” and “after” photographs for sale in the photographer’s window. They purchased several copies and kept them as proud family souvenirs for nearly a century, until Jane Cooke died in 2014.